I made today's bento and hope I can start a new week with a happy heart. And hope the same for all of you. I knew that I just made a few posting in the last 2 weeks. Hope this week I can make full posting from Monday to Friday. I just need to distract myself from the hot weather that we are having here. Standing in the stuffy kitchen is really not my favorite - so I am looking forward to our new kitchen :). Today's two little boys on the top of the shiso leaf were made from quail eggs and decorated with carrot, nori, pink kamaboko, and brussel sprout. Inside the box : rice, quail eggs, red-orange kamaboko, brussel sprouts, minced beef cooked with corn & fried shallot, and broccoli. Your cute bento doesn't suffer from the weather, it's so dear. I think I have this lunch box with the separate container, right? 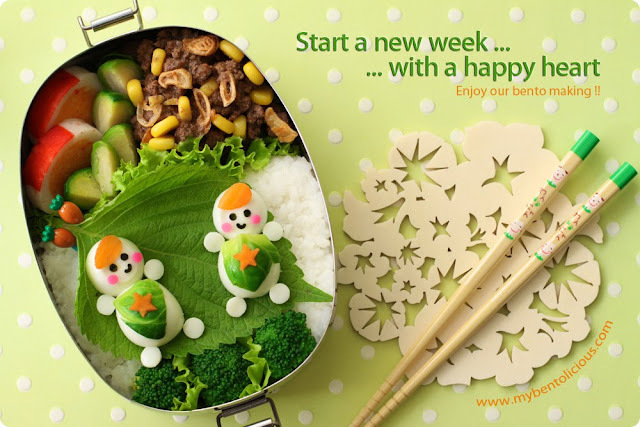 Looks cute and yummy; hope you enjoy a great, happy week too! here it's raining all day :( Your bento is so bright and fresh, really brightens my day! Thanks for sharing dear! Oh my, those little guys are so cute! I love your Box design! ^-^ And how many details those little guys have ;) Really great! This is super cute! I like it! Very nice idea of using the brussel sprout, I like the colours so much! Wish you have a great week ahead! So cute with that little tummies...hahaa and I love the greenery colors. It's simple not overly crowded but soooo cuttteeeee! @Deby Suwito : Thanks a lot Deb! @SIG : Thanks a lot for your nice words! I think I'm just enjoying blogging right now hehehe :) Making a book is way too advance for me, I'm still learning from the others. What cute little boys! Your bentos are always so happy. Sorry it's so hot there...we're waiting for our annual Texas torturing heat so I understand how you feel! Thank you Lia!! I am starting with a happy heart, so thankful for everything I have been given today. I love the shiso leaf! Have a great day! How cute! This bento is sure to start the week out right! Hope things cool off for you. We had a gorgeous weekend and starting a nice week. I love the heat, and humidity (I know....everyone says I'm weird) so it's a good reason to live in Florida. Our rainy season is coming up. Love your cute bento! and the two quail egg boys! It made me smile! What do you ususally do with shiso leaves? @CVmom : Thanks a lot for your kind comment and for visiting my blog! Wow! How do you do these kind of bentos? Done with such cuteness & perfection. I think your photography is ace! @tatabonita : Tummy 'gendut' hehehe ... Too much bento LOL :D Daun Shiso dapet dari supermarket Korea deket rumah. Krn doyan makanan Korea jd suka mampir ke sana Ta. Stainless steel box-nya udah zaman kapan punya Ta punyaku, sekarang mahal lho! Pindah ke Jakarta Ta makanya hahahaha ... Thanks Tata! your bentos *always* give me a happy heart lia! you are such a dear to share that lovely message with your bento friends. these little boys on the leaf are so cheerful, i love them!